That’s right, Amazon are now calling me a ‘mover’ and a ‘shaker’ – clearly they’ve never seen me on a dancefloor! 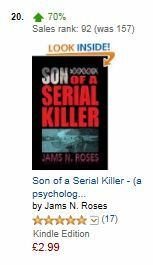 My book is now on the first page of Amazon UK’s list of thrillers for Kindle. 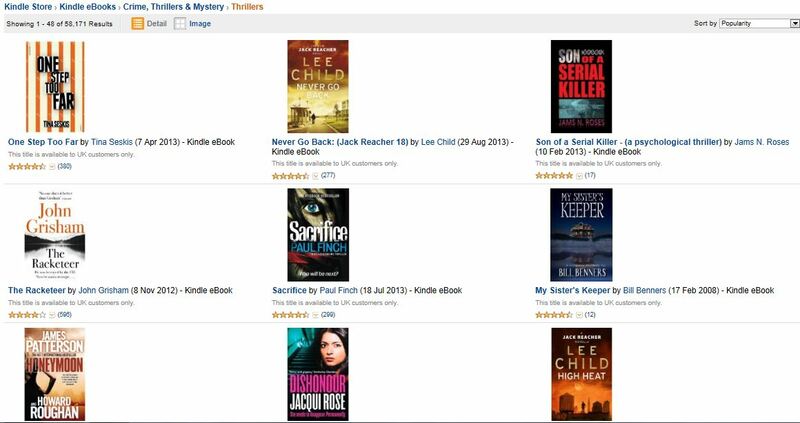 Son of a Serial Killer shares the same screen as a couple of Jack Reacher books and also a title by James Patterson, Honeymoon. I am now a best-seller! I’m kind of excited but hesitant to believe what I’m seeing! 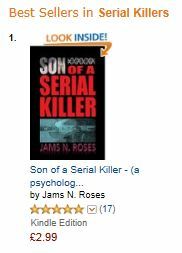 I don’t know how long it will last, but Son of a Serial Killer is number 1 in two categories on Amazon UK, and ranked about #150 overall as I type this. This, dear readers, is a big deal to me. I’m struggling for cash at the moment (seriously) and although the money takes a while to trickle through the Amazon accounts and end up within my grasp in the South of France, the fact that it is on its very, very, slow way towards me has given me a lift. People are buying my book. In a significant number. Happy, happy, happy. So far, reviews have been positive, with the odd big meanie not liking or quite getting my style, but that’s ok. There are plenty of books I haven’t liked much but others have raved about. Horses for courses, as they say. Anyway, I just wanted to share something positive in my life right now. Peace. Me? Under the spotlight? You really want to see all of my imperfections? Over the next few paragraphs, I’ll try and summarize where I’m coming from, so you’ll maybe have an idea as to what to expect from my writing. I am not a criminal, not in the sense that I’ll rob your bag when you’re not looking, or I’ll steal the food from your plate even when I’m not hungry, just to be a nuisance. I won’t threaten you in the street for looking at me funny, nor will I throw bricks at your windows if you don’t give me a cigarette when I ask for one. But I have been arrested on more than one occasion. I’ve been locked up, I’ve had my prints and mug shots taken and of course, as a sign of the times, they’ve even taken my DNA. But I’m not a real criminal. And I’m not a drug addict either. Although if I’m honest, I’d have to tell you that in several of the recent years of my life, I’ve spent more money on cocaine, alcohol and cigarettes than I’ve spent on the rent for the dirty, little apartment that I’d been living in. I’ve mistreated friends and loved ones and lost some people that were close to my heart, but at the time I was too blinded to see the irreparable damage I was doing to relationships. Things change, and people change, too. Luckily, after all the stunts I’d pulled, all the ridiculous and dangerous situations I’d found myself in, things started to go on track. I’m a daddy now, and that little boy of mine is the angel that keeps me away from trouble, away from even the situations where trouble could potentially arise. Of course, I am no angel, but I am no sinner. I have found a way to channel my naughty side, a way to allow my mind to have a free run with its mischievous ideas and not cause any trouble, and nobody gets hurt or embarrassed or let down. I found that by writing my thoughts, those dark little waves of energy in my head, down onto paper, or tapping them into a keyboard and onto a computer, relieved some of my desire to be in the mix myself. I stopped needing to be in the bars or the pubs and didn’t need to be high or drunk to have fun. I’ve learnt that by creating a separate world where anything goes, I can keep the world in which my son walks and plays as safe and as beautiful as possible. I draw on my previous experiences for my writing. ‘Get Clean’ is based loosely on my drug problems and the time I spent living on the notorious southern coast of Spain. ‘Son of a Serial Killer’ is heavily based on the thoughts and emotions I had during the break-up of a serious relationship, which all seemed too much when on top of the other daily struggles we all go through. I hope to have an exciting life in the future, one that I can draw on for future ideas and plots and characters for my fiction novels, who knows, maybe I’ll even get to write a love story, but I’m not holding my breath! That was a piece I did for LaeLand – A place where Lae Monie and other criminals get to put their points of view across. It’s a good place for writer’s resources as well, so take a look, just make sure that you stash your cash in your shoe first! I recently wrote a piece on the creation of characters, and this has been published as a guest post on the ‘Imaginary Friends’ blog. If you have an interest in the thoughts or ideas of creating a villain or hero, then please take a look, comment, share and get involved. For those of you that don’t know of Imaginary Friends, it is a blog by Sara Jayne Townsend, author of ‘Suffer the Children’ and ‘Death Scene’. I promise, it’s not all as morbid as it sounds over there (a little, maybe), but if you have an interest in crime or horror stories than it is well worth taking a look. So, with two books published and selling on Amazon, and the occasional guest post to help promote them, I was left with a choice about what my next project should be. Statistically speaking, a good option would be to write a sequel to one of my previous novels, as this seems to go down with readers. Both books have had positive reviews so far, so this would be the next logical step. However, I am an artist (apparently I am, being a writer, however outside of this blog I’d be too shy to announce it to the world), and although logical in some respects of life, when it comes to my art, my passion, I am as sensible and organised as Van Gogh on acid. This doesn’t mean I will not revisit the characters from Get Clean or Son of a Serial Killer, those that survived that is (spoiler? maybe, you’ll have to read them and find out), but for now I have decided to concentrate on an old screenplay that I wrote, and to novelize that. Extremely England (working title) is not the crime/thriller/mystery that either of the previous book were, and if I said that I was 100% sure that the audience who have appreciated those books would definitely be into the new project, I’d either be stretching the truth or straight-up lying! Somebody who loves to read about the dark side of crime, death, depressive situations and hate is not necessarily going to love Extremely England, a light-hearted view of the problems faced (in reality or just through the eyes of the media) in my beloved country of birth. Draft Zero of the screenplay was heavily influenced by the early Woody Allen hysterical comedies; Take the Money and Run, Bananas, etc., and I also realise these are not to everyone’s taste. Changing the format from visually comical script into a laugh-out-loud novel won’t prove to be easy, but I’m willing to give it a go. Of course, the fact that I have a printed manuscript to work from means the new novel should make progress a little easier than working from random notes, half-memories and random nuggets of inspiration – I really do hope this is the case! So there it is, for the time being, I’m changing genre.